Here's a bird's eye view of one of our cards from the latest Cocoa Beach Library Stampers' Class. Such fun! We used the Happy Heart Textured Impressions Folder on our heart cut out and used the Petite Petals stamps and punch to create both the Rose Red flowers and the Mossy Meadow stamped leaves. 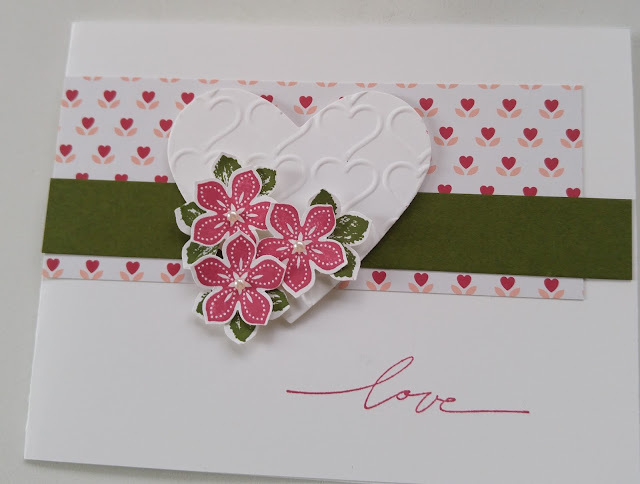 Our DSP is from the beautiful Love Blossoms Designer Series Paper Stack. I love those papers--48 sheets of 6 X 6 double sided pretty!! Have a happy and creative day!! Ooh, that's a beautiful card, Ree. What other ones did you all make?